The thing is, are all our birds retroactively going to get the secondary type dinosaur? Yeah, of course not, but that would have been cool. It’s “Whenever this creature is dealt damage, draw a card” actually. could be dinosaurs you control have haste, and looks like it has a triggered ability having to do with eithe ritself entering the battlefield, but because of the tribal nature of the set it could also be whenever a dinosaur enters the battlefield under your control. I want to see banding dinosaurs or I will be so disappoint. Is it really? I feel like just Glorybringer on his own is still better than Burning Dino with haste. Think about it: Costs only five mana, has haste on its own, and pings something for *4* damage the turn it comes into play, almost guaranteed to hit opponent for *4* when it comes out. But that’s not a dinosaur, it’s like putting phyrexian obliterator in a vampire deck. I’m just saying, there’s a Dragon in Standard that does removal and damage to the face better than Burning Dino does with haste. But you won’t be able to tap the dino mana dork to help it, you won’t be able to cheat it out with the legend, ect. think you mean Wakening Sun’s Avatar, since that will kill everything except your dinos, leaving an open board with a 4/4, 3/3 and 7/7 on your side, all of which can attack. This card is a pretty good bomb though. Two bodies with 7 power coming out of nowhere? Unplayable. Creature type should clearly be Rat. Kinda weird to see “other ____ have haste” on a card that doesn’t have haste itself. Feels strange. I feel the opposite, as this sort of tribal bonus is more in line with older tribal bonuses. But if you’ve only been a player the last couple years, you’re certainly right in this feeling strange. Goblin lords that gave haste had haste themselves in the past (Goblin Warchief, Goblin Chieftain). When Vin Diesel and Dwane “The Rock” Johnson get sent back in time from a nitro boosted explosion. Now the only way they can get back is by riding their new Dinosaur pets faster and more furiously than ever before!!! Ooooh you’re right! The trouble would be in having your Saheeli alive/usable when this guy comes down. But Temur Dinos can definitely be a thing. Fingers crossed for this in my sealed pool. pretty good lord for dino tribal. with land ramp and mana dorks it should be feasible to get this out a good bit before turn 5, and then you can really start tearing things up. 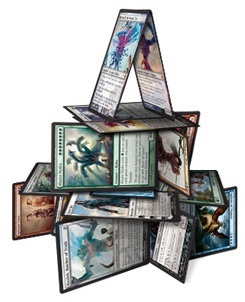 but like with Dino tribal, how many dinosaurs are you going to run when they’re all pretty expensive? They’re not all going to be expensive. MaRo said there’s small dinos. They’re probably all commons though. Kinjalli’s Sunwing could be counted as small dino from MaRos perspective. And maybe even Ripjaw Raptor. Remember when I said I wanted midrange Dinos? You always take Glorybringer except you play Dino Tribal. From what I’ve seen right now Dinos will use green as main color and white as second color. Red is more or less the color you want to split in to cast the Regisaur Alpha, Huatli and Gishath. Savage Stomp (S),Drover of the Mighty (H), Ripjaw Raptor (D) and Carnage Tyrant (D) are really good reasons for green, while Priest of the Wakening Sun and Kinjalli’s Sunwing help to slow down your opponent in the early game and keep you alive. And Waking Sun’s Avatar can finish your opponents Board and is at least a usefull card for the Sideboard. I wonder if there is a way to cheat out Gishath really early but that still needs a certain amount of Dinos in the Deck but in that case I would rather cheat Sun-Crowned Hunters and Raging Swordtooth out together because each Raging Swordtooth let every Sun-Crowned Hunters deal 3 damage to my opponent. But to come back to your original question Glorybringer is the better choice for most decks. We still don’t know what other Dino cards we get and with that it’s uncertain if this guy could even get its own deck in standard. It’s like RG Armada Wurm. And I looooved me some Armada Wurm. It’s a shame the lack of Trample, but I won’t complain for the sweet 3/3 that will attack the turn it ETB. This and Huatli both make for good 5cmc drops, either way you’ll have a 3/3 Trample.